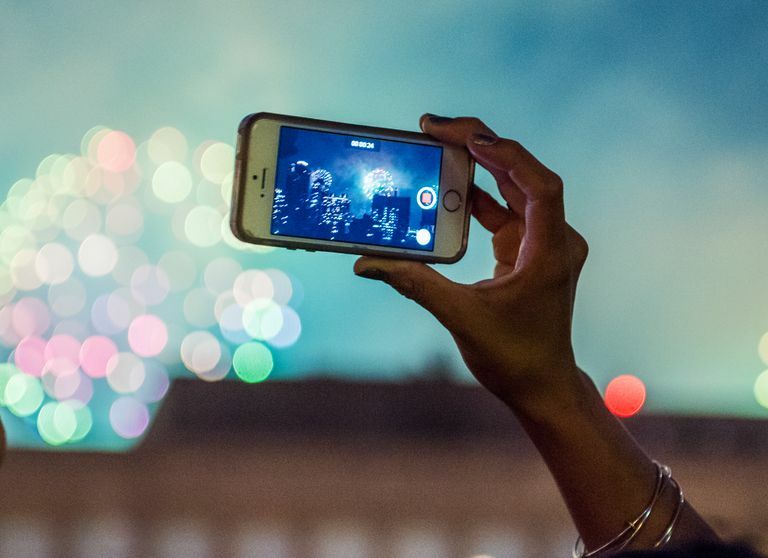 You can add all sorts of fireworks to your video on your iPhone or iPad with Apple Clips. The Clips app, from Apple, allows you to create a new short video from existing photos and videos as well as being able to record new video right inside the app itself. Clips allows you to overlay graphics and add effects to make the video fun and really quite polished. Clips calls each compilation of videos and photos a project and you can only have one project open at a time. As you add more content to your project, you'll see the list of items grow nearly the middle left side of the screen. If you decide to stop working on a project and come back to it later, you can save your project and then open it again when you're ready. Tap Search in the lower-right corner of the screen. Type Clips in the Search box. Swipe up and down in the results screen if necessary. When you see the Clips app, tap Get to the right of the app name. After you install Clips, tap Open. After you open Clips, you’ll see what your front camera sees on the screen and you can start taking a video. The pop-up balloon tells you to hold the red button to record video. Start recording a video by tapping and holding on the red Record button. If you want to take a video using the rear camera, tap the camera switch button above the Record button. As you record the video, you see the video frames scrolling from right to left in the lower-left corner of the screen. You need to record one full frame before you can release the Record button. If you don’t, you see a message above the Record button asking you to hold down the button again. After you release your finger, the video clip appears in the lower-left corner of the screen. Add another video by tapping and holding on the Record button again. Take a photo by tapping the white shutter button. You can take a photo and add it to your project by tapping the large white shutter button above the Record button. Then, hold down the Record button until you see at least one full frame in the lower-left corner of the screen. Add another photo by tapping the Redo button and then following the directions above. Each photo and video appears in a thumbnail-sized tile. Tap Library below the viewer. Thumbnail-sized tiles appear within the viewer. Tiles that contain videos have the running time in the lower-right corner of the tile. Swipe up and down within the viewer to view all your photos and videos. When you find a photo or video you want to add, tap the tile. If you tap a photo, tap and hold the Record button until the first frame appears in its entirety in the lower-left corner of the screen. The options for the highlighted editing category appear at the bottom of the screen. Each photo or video you take, or any photo or video you add from the Camera Roll, is added to your project. A project can include different clips from different sources. For example, you can add a photo as the first clip, two videos as the second and third clip, and a photo from your Camera Roll as your fourth clip. The most recent clip you added or recorded appears at the right side of the row of clips in the lower-left corner of the screen. Play the clips in sequence by tapping the Play icon to the left of the row of clips. If there are too many clips to fit on the screen, swipe left and right to view all the clips. Filters: Add one of 15 filters to the clip, such as Noir to make the photo or video black and white. Labels: Add a text image to your photo or video. Stickers: Add a cartoon image or a shape (such as a check mark) on top of your photo or video. Emoji: Select an emoji to add on top of your photo or video. When you're finished adding effects, tap the X icon to the right of the Emoji option. If you want to change or remove an effect from a clip, tap the clip tile at the bottom of the screen. Then tap the Effects icon, select the effect option, and select a new effect. Remove a filter by tapping the Filters option if necessary and then tap the Original filter tile. Tap the Labels, Stickers, or Emoji option. Tap the label, sticker, or emoji in the center of the photo or video. Tap the X icon above and to the left of the label, sticker, or emoji. Tap Done at the bottom of the screen to close the Effects screen. The clip you're moving in Apple Clips appears larger in the row of clips. Within the row of clips at the bottom of the screen, you can rearrange them by tapping and holding on a clip and then moving the clip to the left or right. Your selected clip appears larger in the row as you hold it and move it. As you move the clip, other clips move aside so you can place your clip in your desired location. When you move the clip to the left, the clip will appear earlier in the project video, and a clip moved to the right will appear later in the video. You can delete a clip by tapping the clip. In the clip editing area below the viewer, tap the trash can icon and then tap Delete Clip in the menu. If you decide against deleting the clip, close the clip editing area by tapping Done at the bottom of the screen. The Share window appears in the bottom two-thirds of the Apple Clips screen. When you’re happy with the project, be sure to save it as a video by tapping the Share icon in the lower-right corner of the screen. Save the project to your iPhone or iPad by tapping Save Video. After a few seconds, the Saved to Library popup window appears on the screen; close it by tapping OK in the window. Top: Send the video to a recent recipient of an instant or email message by tapping the recipient’s icon. Middle: Swipe to the left and right to view all the icons within the row and then tap on the app icon to send the video to that app. If you don’t see the app you want to use, such as Facebook, tap More to view more sharing options. Bottom: Save the video as detailed above, save the video to another location, or tap More to tell Clips where to save the video. Cancel: Close the Share window without sending the video anywhere by tapping Cancel. The currently open project is highlighted in red at the top of the screen. By default, the last project you worked on appears at the bottom of the screen the next time you launch Clips. You can also view saved projects by tapping the Projects icon in the upper-left corner of the screen. Each project tile shows several photos or videos within each tile. Underneath each tile, you see the date the project was last saved and the length of the project video. Swipe back and forth within the project tile row to view all your projects, and tap a tile to open it. The first clip within the project appears in the center of the screen, and all clips within the project appears at the bottom of the screen so you can view and edit them. You can create a new project by tapping the Create New icon at the left side of the project tile row. Clips Can Transport You to Another World!